When Microsoft took the wraps off Windows Phone 8.1 just a couple of months ago, many users rejoiced at the broad range of features that had been introduced. Everything that we expected of the announcement turned out to be true, but even though we really ought to be focusing our attentions on core features like, for example, the new notifications infrastructure, the Cortana voice assistant has commanded a large portion of attention. Just like when Apple introduced Siri, we don’t seem to be able to get enough of these personable, digital voice recognition features, and in a new ad to promote Windows Phone 8.1, the software giant has pitted the Lumia 635 and Cortana up against the iPhone 5s and Siri. It was said even prior to this year’s BUILD developers conference that Cortana would take some of the best bits of Siri and Google Now and mold the end product into the perfect all-rounder. From what we’ve seen, this does indeed appear to be the case, and although we wouldn’t necessarily say that one is better than any of the other voice assistants, Cortana looks the most promising. The new 30-second clip sees the user first ask Cortana to remind him about their anniversary next time his wife calls him. Cortana responds promptly, whereas Siri can only muster an “oh no, I can not do that,” and when the user also tasks Cortana with reminding him to pick up flowers next time he happens to be passing by a flower shop, Siri is once again unable to compete. Humorously, Siri even seems slightly awestruck by the Lumia 635, but while these ads tend to be lopsided and biased, it’s fair to say that Cortana has been worth the wait. To be honest, given how far behind Microsoft remains in the battle of the smartphone platforms, Cortana was a feature that really needed to be solid right off the bat, and as we’ve seen on numerous occasions, it doesn’t let the side down. Below, you can check out the new short from Microsoft its entirety, and as ever, be sure to leave your thoughts, opinions and comments via the usual channels. 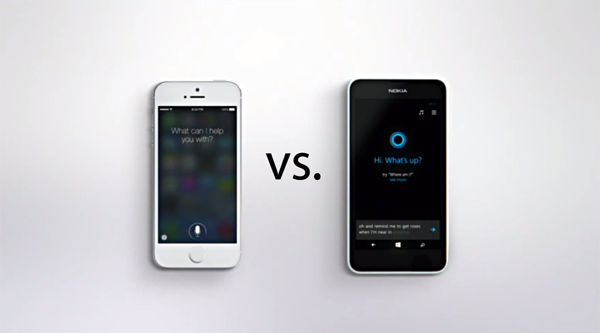 Siri works about 80% of the time, Cortana works about 25% of the time.